Most of us consider our pets as members of the family so, including them in our cherished holiday traditions comes naturally. While including your pet in your seasonal gift shopping may be par for the course, what should you get the pet that has everything? At Lone Tree Veterinary Medical Center, we understand the special role pets play in our lives, which is why we’ve put together a list of favorite holiday pet gifts for 2016. What better way to show your appreciation for all the love and joy your pet brings to your life than by providing him or her the gift of vitality and good health? An annual or semi-annual wellness exam is one of the most important gifts you can give your pet to make sure you know what’s going on beneath the fur. It’s well established that routine checkups help pets live healthier and happier lives, as problems can be found and treated early on, before they become major issues. Haven’t had your pet spayed or neutered yet? Make this the year you attend to this important health procedure. Studies show that spayed and neutered pets live longer! Good dental care is an essential component of your pet’s overall health. A new pet toothbrush and pet-safe toothpaste make great stocking stuffers, as do dental chews and treats. Better yet, schedule that overdue appointment for a professional dental exam and cleaning for your pet. Pamper your pet and support its healthy skin and haircoat with a professional grooming session in our Grooming Salon. Whether you have a new puppy just learning the ropes, or an older dog in need of a tune-up, obedience classes in our Canine Academy will help your dog become a fully integrated and happy member of your human “pack”. Check out our selection of pet-approved dog and cat toys, treats, food and care products in our lobby retail shop. We have stocking-stuffers that are sure to please any four-legged friend. Consider a comfy elevated bed (try orthopedic or heated versions for older or arthritic pets). A Thundershirt for the anxious pet (use for high-stress situations, only). A Wonder Walker dog harness, the perfect dog-walking tool. We carry them in a variety of sizes and colors. Pet snow booties, sweaters and rain gear are wearable gifts your pet will appreciate on outdoor winter excursions. Be sure to properly fit your pet — not too loose, not too tight — and remove when indoors. Build your own cat tree or kitty hide-out. This t-shirt ball toy can be made using items you probably have at home. Food puzzles help fast eaters slow down while stimulating those foraging instincts. For your pet’s safety, do supervise your pet while it’s playing with a toy, regardless of what it is. Still can’t decide what to get for your furry loved one this holiday season? 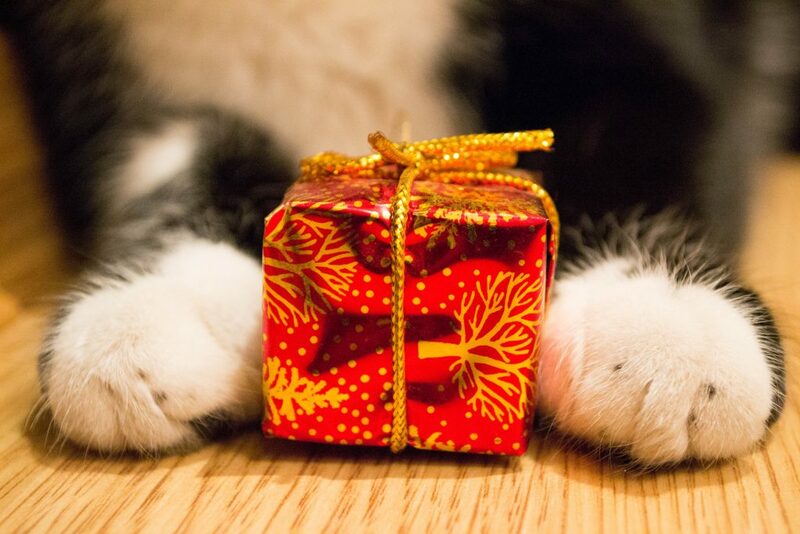 Chances are, you’ve already given your pet the best gift of all: a loving home with you! Take a few moments out of the daily holiday hustle to show your pet how much you care with a walk, play session, favorite activity, or just good old-fashioned snuggles. Time spent together doesn’t cost a dime, and provides bonding and comfort to both you and your pet. As always, don’t hesitate to give us a call with your questions or concerns. We wish you, your family — two legged and four — a happy and healthy holiday season!